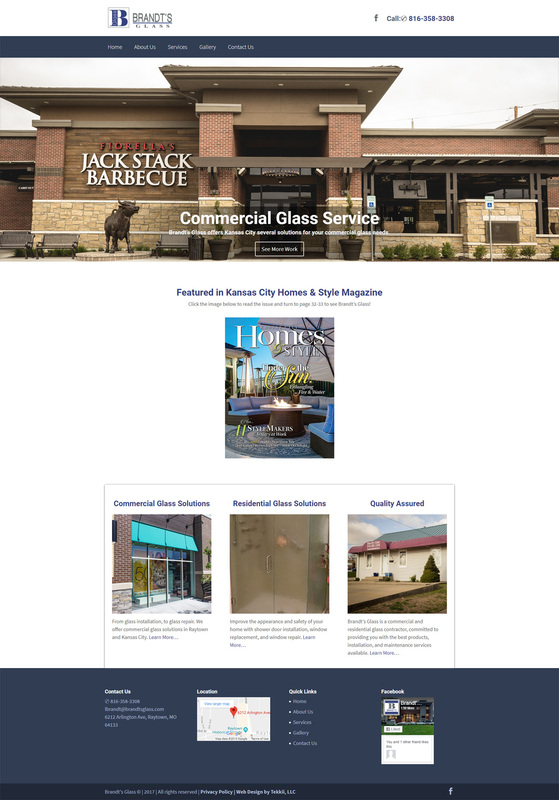 Brandt’s Glass – Glass Installation & Repair in Raytown, MO previously had a website built for them, but they had lost contact with the original developer and were in need of updates. Their plan for a website was simple. Show off their incredible commercial glass work with great photography and the customers will come. This strategy has worked fantastically. Upon arrival to the Brandt’s Glass website, you see their best work before you. After we improved the website’s design, we planned a number of photography sessions to capture the incredible job they do on a daily basis. Their customers will visit and see that Brandt’s Glass is highly capable of completing the jobs that need to be completed. We congratulate Brandt’s Glass on all of their continued success in Raytown and beyond in Kansas City! Have a project in mind? Need help with web or digital marketing related questions? Feel free to shoot us a message. © Copyright Tekkii, LLC. All Rights Reserved.